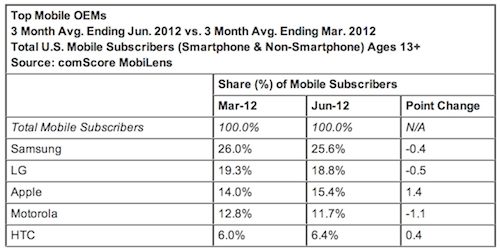 comScore, the global leader in measuring the digital world and preferred source of digital business analytics, has today released data from the comScore MobiLens service reporting overall U.S. mobile phone market share during the three month average period ending June 2012. The numbers reveal that Apple continues to gain share in the OEM market ranking third with 15.4% of mobile subscribers and is the only cell phone maker to gain market share by 1.4 points. At the same time, leading Android manufacturers including Samsung, LG and Motorola all lost some market share during the three months period. The study surveyed more than 30,000 U.S. mobile subscribers and found Samsung to be the top handset manufacturer overall with 25.6 percent market share. Google Android continued to grow its share in the U.S. smartphone market, accounting for 51.6 percent of smartphone subscribers, while Apple captured 32.4 percent. 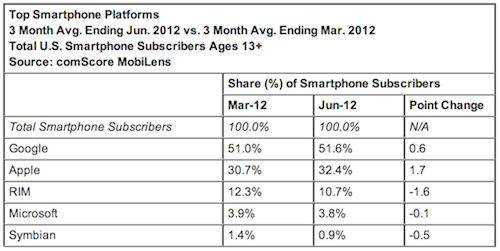 Also, Apple’s iOS outgrew Android in the three-month period from 1.7 points to 0.6 points.